Save on your next flight from BFD to BOS when you book through Travelocity. Need a last-minute flight to Boston? Travelocity offers discount airfare no matter when you book, even on popular routes such as Bradford Regional Airport to Logan Intl. Airport. Whether you need a direct or indirect flight, you can trust Travelocity to provide you with the best prices for BFD to BOS flights. Flight path for flights from Bradford Airport to Logan International Airport. This hotel is connected to Logan Airport terminals by a climate-controlled skybridge. A complimentary 24-hour airport shuttle is also available. Located in historic Back Bay, this hotel just completed a $100 million dollar renovation, and is 3 miles from Logan International Airport and 200 yards from the Boston Common and Public Garden. The hotel is easily accessible to Newbury Street shopping. 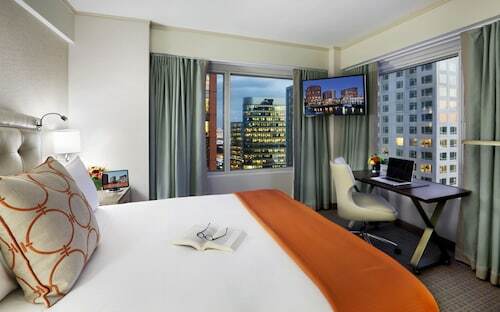 Embassy Suites Boston Logan Airport is less than 2 miles from the airport, 3 miles from Faneuil Hall, and 4 miles from downtown Boston and the New England Aquarium. Atop Commonwealth Pier, near the Seaport World Trade Center and the Boston Convention & Exhibit Center, this hotel is one mile from the Financial District, three miles from Logan Airport, and a 10-minute bus ride from South Station.